It always seems that even though I love the summer, I end up being pretty lazy for the majority of it. I end up sitting in the air conditioned splendor of my apartment and not wanting to do much of anything once I get home from work. Even though it seems like most of my summer was spent sitting on my comfortable couch, with my girlfriend and our laptops, TV shows and books -- we did manage to do some fun stuff. We went to the Seattle area for a week in the beginning of July to visit my girlfriend's brother, his wife and their son. We had a blast which involved a decent amount of fireworks, drinking, shopping, eating and attempting to stay cool. For a place that has the reputation of being drenched in an almost constant rain, it barely sprinkled only the last morning we were there. It was hot, humid and sunny the entire rest of the week. I learned that if a toddler says "I have idea." to make sure to hold onto the fireplace lighter that you've been using to light fireworks because it will be snatched out of your back pocket. Also, if said toddler comes down from upstairs with his hands behind his back, that there's probably something that he shouldn't have in those hands. I also turned 30 at the end of July! It was nice and low-key, just like I wanted. My girlfriend cooked me a nice dinner on my actual birthday, her mother took me out to dinner at Brown's on the day after and my family had a BBQ on the day after that. So it was three nice days of birthday celebration, but nothing too crazy. I purchased an Acer Aspire One 8.9" netbook as an early birthday present for myself and to bring on our trip to WA. It was nice to be able to check mail, pay bills, look for things to do, check plane schedules at the airport, and more all in a tiny, portable little package. I think it was well worth the money I spent on it, even though the battery life (with the 3-cell battery) isn't great and I tend to use my Dell Vostro as my main computer when I'm in the apartment. The display seems bigger and usable than the 8.9" size suggests and it's been trouble free, so far! Last weekend we went to The Clark to see the Dove/O'Keeffe: Circles of Influence exhibit. 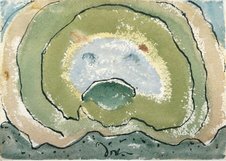 There were a lot of interesting oil paintings, watercolors, pastels and collages there (between Dove and O'Keeffe) with one of the most humorous pairings being Arthur Dove's watercolor Happy Clam Shell next to Georgia O'Keeffe's pastel Slightly Open Clam Shell. The pictures linked above are from this review of the show by Judith H. Dobrzynski on the Arts Journal website. There is also another review for Wall Street Journal by the same author that was interesting. There was some other fun stuff sprinkled in there but those were the big highlights... all in all it was a good summer.